WASHINGTON — Secretary of State Mike Pompeo backed continued U.S. military support for Saudi Arabia’s war in Yemen over the objections of staff members after being warned a cutoff could jeopardize $2 billion in weapons sales to America’s Gulf allies, the Wall Street Journal reported. Citing a a classified memo and people familiar with the decision, the newspaper reported Thursday that Pompeo — in certifying Riyadh and Abu Dhabi were doing all they could to avert civilian casualties in the war — sided with a legislative affairs team that argued suspending support could undercut plans to sell more than 120,000 precision-guided missiles to Saudi Arabia and the United Arab Emirates. Despite U.S. intelligence support and training for the Saudi-led coalition meant to minimize civilian casualties, a recent United Nations report said the coalition was responsible for most of the 16,700 civilians killed or injured in Yemen over the last three years. Pompeo last week certified the governments of Saudi Arabia and the United Arab Emirates are "undertaking demonstrable actions to reduce the risk of harm to civilians.” The move — which came a month after a Saudi-led airstrike in Yemen hit a bus filled with children — has inflamed lawmakers opposed to U.S. involvement in the conflict. The certification, which allows the U.S. military to continue its assistance to the Saudi-led coalition fighting Houthi rebels in Yemen, also received backing from Defense Secretary Jim Mattis. That aid includes arms sales and aerial refueling of coalition fighter jets, which carry out airstrikes in Yemen. A senior State Department official declined to comment “on the deliberative process or allegedly leaked documents,” but said the department is continuing to pressure its coalition allies to do better in their fight against Iran-backed Houthi rebels. “While our Saudi and Emirati partners are making progress on these fronts, we are continuing discussions with them on additional steps they can take to address the humanitarian situation, advance the political track in cooperation with the UN Special Envoy’s efforts, and ensure that their military campaign complies with the law of armed conflict and international humanitarian law,” the official said in a statement. State Department experts reportedly urged Pompeo to tell Congress he couldn’t certify that the Gulf nations were doing enough to minimize civilian casualties, but that the U.S. would continue to provide military support to the coalition because it is in America’s national security interest. The top Democrat on the Senate Foreign Relations Committee, Sen. Bob Menendez, D-N.J., has for months been delaying a U.S. sale of precision-guided munitions to Riyadh. Menendez sent a letter in June objecting to the sale of precision guided munitions to Saudi Arabia and the UAE unless administration makes, “a compelling, evidence-based case that U.S. weapons sales contribute to reduced civilian casualties and are leverage in a broader strategy to increase humanitarian access and end the war,” he said in a statement Thursday. "Three months later, I am still waiting for them to respond to my concerns,” he said. In March, the Senate voted 55-44 to scuttle a measure to invoke the War Powers Act and extract the U.S. military from the Yemen civil war. The effort led to a legal requirement that Pompeo periodically certify Riyadh and Abu Dhabi are taking meaningful steps to avoid civilian casualties and permit humanitarian aid; otherwise U.S. military aid must cease. 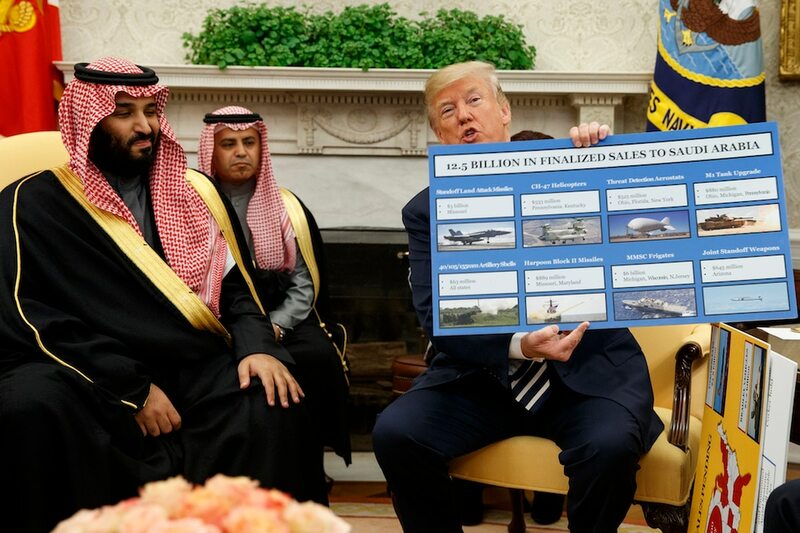 Early in his administration, U.S. President Donald Trump met with Saudi officials and drew headlines for what was billed as a $110 billion arms agreement. That deal was supposed to include seven Terminal High Altitude Area Defense missile defense batteries, more than 100,000 air-to-ground munitions and billions of dollars' worth of new aircraft. A signature initiative of the State Department under Trump has been to boost arms exports by easing regulations and emphasizing the positive impact on the U.S. economy. A key face of that initiative, Tina Kaidanow, recently departed the department to lead the Pentagon’s office of International Cooperation, under the department’s reconstituted Acquisition and Sustainment office.